Crop Update: Wheat is mostly in various stages of heading through pollination in this part of the State. The wheat scab risk prediction model (http://www.wheatscab.psu.edu/) was forecasting higher potential for scab in portions of Nebraska last week with a relax in the model this week due to higher temperatures and no moisture. Please keep an eye on your growth stages, the weather, and the model for risk of scab in your wheat. Don’t have too much in the way of corn and soybean updates other than it’s good to see guys finishing planting and getting herbicide applications down. Waterhemp and palmer range in size from emergence to 4 inches from what I was seeing this past week. Also a reminder to install irrigation scheduling equipment soon. It’s always easier to install earlier than when plants get larger! Check out this week’s CropWatch article at https://go.unl.edu/n0u0 which shares additional information about ET gage sites; reminders and tips for installing ET gages and watermark sensors. Wheat and Field Pea Field Days: There are 11 upcoming wheat field days throughout the State, many of them coupled with field pea/pulse/cover crop field days as well. During the field visits participants will be able to learn more about different varieties of wheat, field peas, chickpeas and forages. Depending on the location, field visits will also include demonstrations of other specialty crops (lentils, winter canola, forages, cover crops) and effects that different agronomic practices (planting dates, seeding rates, fertilizer management, etc.) have on crop yield and yield quality. Besides field visits, the field days will feature indoor sessions with a free lunch, a 30-minute networking session, and brief research updates. Networking sessions will allow participants to meet with seed, processing, and marketing businesses critical to pulse cop industry development in Nebraska. The research updates will include: Production and marketing of pulse crops, Incorporating cover crops in wheat and field pea cropping systems, and Wheat production – management for higher yield and grain protein. Area dates/locations are listed below and all flyers with additional information can be viewed at: https://go.unl.edu/vto8. Nebraska Field Pea Field Days are free, thanks to sponsorship by the Sustainable Agriculture and Research Education (SARE) in Nebraska, the Nebraska Environmental Trust, and the pulse crops seed and processing industry. South Central Ag Lab (SCAL) Weed Science and Cover Crop Field Day: View demonstrations of new technologies and herbicides for weed control in corn, soybeans, and sorghum and effects of cover crops on soil health and pest management at the June 27 Weed Management and Cover Crops Field Day. It will be held at the South Central Ag Lab near Clay Center. 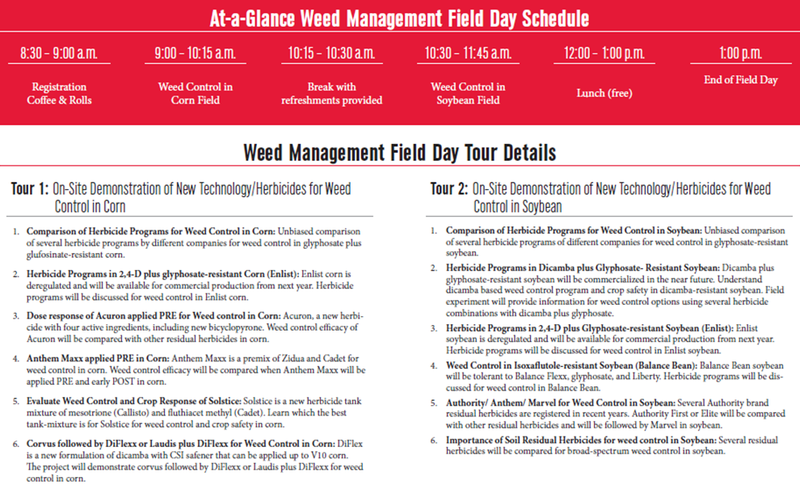 The day begins with registration and rolls at 8 a.m., followed by weed management tours from 8:30 a.m. – noon, and cover crop demonstrations from 1 to 3 p.m. A free lunch will be served. In addition to the field demonstrations, Jim Specht, University of Nebraska-Lincoln professor emeritus, will presented on “Optimizing Soybean Planting Date, Seeding Rate, and Seeding Depth in Nebraska.” CCA credits will be available. 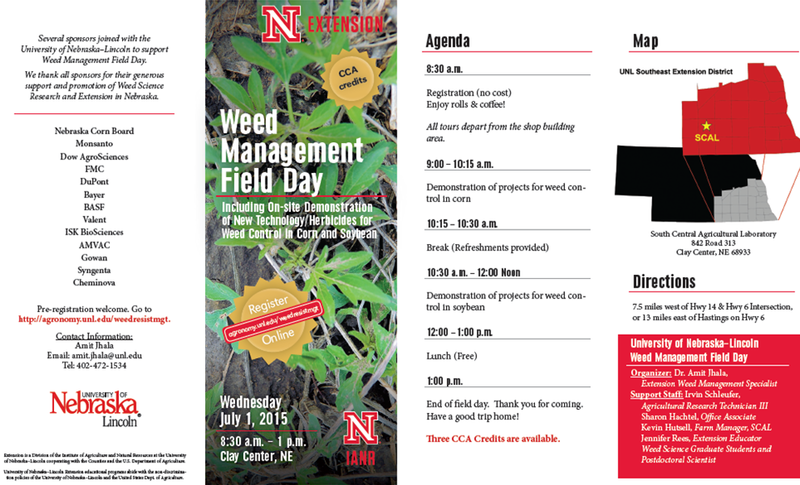 Please pre-register at: https://agronomy.unl.edu/fieldday. The South Central Ag Lab is 4.5 miles west of the intersection of Hwy 14 south (to Clay Center) and Hwy 6 or 12.4 miles east of Hastings on Hwy 6. GPS coordinates: 40.57539, -98.13776. Comparison of Herbicide Programs for Weed Control in Soybean including Roundup Ready 2 Xtend and Liberty Link Soybean, Examples of spraying the wrong herbicide on wrong soybean herbicide-resistant cultivar, Weed removal at different growth stages and yield impacts, and Understanding multiple herbicide-resistant soybean herbicide programs. Comparison of Herbicide Programs for Weed Control in Corn including glyphosate and glufosinate-resistant corn in addition to several new corn herbicides, response of white and yellow popcorn to various herbicide chemistries and off-target movement, control of volunteer corn in Enlist Corn, and Weed Control and Crop Response in INZEN sorghum. An Overview of the Effects of Cover Crops on weed suppression, pests (particularly wheat stem maggot) and beneficial insects. Cover Crop Effects on Soil Health, including changes in soil microbial communities and soil physical properties with a focus on cover crop root biomass.